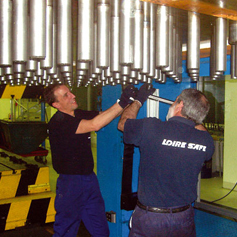 Loire Service can meet our clients’ service requirements anywhere in the world. The service can be accessed by the means listed in the Contact section. 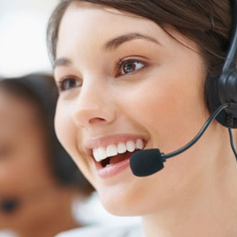 Remote technical assistance from our qualified staff. 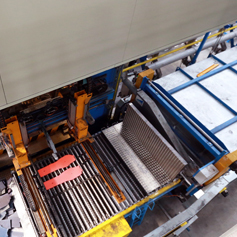 By establishing remote communication between the server at Loire Service and the automatic controller of the press, Loire Service’s technicians can take control of the programme as though they were physically in front of the machine. This means that they can examine it, modify the machine’s data and settings, detect possible errors and immediately make the necessary corrections. Clients can benefit from our experienced technicians’ knowledge without any need for them to travel, resulting in a significant gain in time and money. 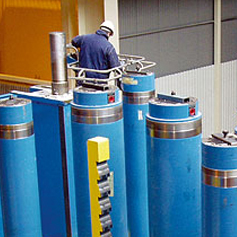 We provide inspections of the hydraulic safety system, the electrical safety circuit, the suspension elements, the stop time, the safety distances, the photoelectric cells, the press’s guards and its enclosure and indeed any point that might suffer wear and tear and so cause poor functioning of the machine or cause any danger. We offer a preventative maintenance contract with a regular schedule of visits. 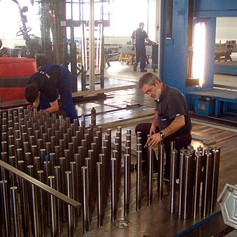 On these visits our technicians use an established verification process to test the different parts of the press, identify potential problems and propose solutions. A record of the maintenance procedures carried out is kept, for future visits. We offer a corrective maintenance service to ensure a rapid solution to any potential problems that might arise. We deliver theoretical and practical training courses to maximise your machines’ potential, and help ensure greater productivity. We can retrofit old and worn machines or ones that are non-operational, enabling optimization of their performance and a cost saving compared with a new machine. These are one-off projects jointly planned with the client that can involve modernising specific parts of the machine to improve productivity or safety, for example to meet the most recent legal requirements. 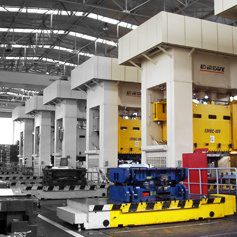 Changes that we have carried out include fitting new control panels, adding additional groups of motor pumps to increase the speed and consequently the machine’s productivity, adaptation of the lubrication system for the guides, integrating a system for controlling cut parallelism and cushioning or replacing fixed lower bolsters with slide-out bolsters. We offer load and unloading feed-systems by robot, transfer, feeder or other systems, and integrate them with the press to increase its productivity. 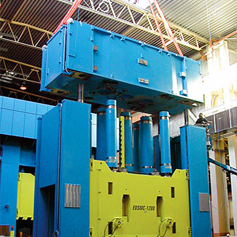 Rapid moves (disassembly and reassembly of the presses in the new location) by specialised staff from the manufacturer, reducing the restart time for production.